In this drawing, defense witness Steven Bennett takes the stand as the prosecutions case draws to a close. A photographer testified Tuesday that while at Fort Hood for a graduation ceremony in November 2009, he took pictures of the gunman as he was prowling around during the 2009 attack. 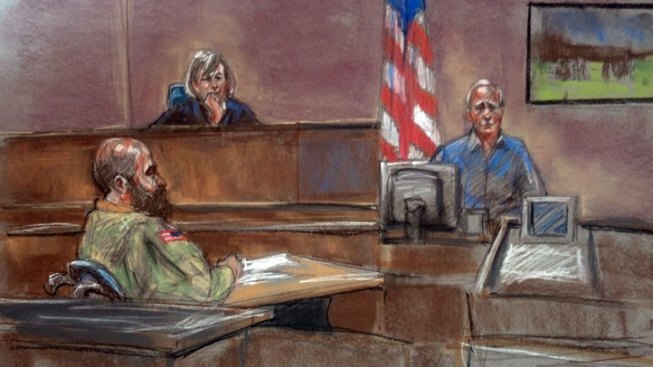 The photographer, Steven Bennett, was among the last witnesses to take the stand before the prosecution rested Tuesday in the Fort Hood mass shooting trial of Army Maj. Nidal Hasan on Tuesday. Bennett, who was unaware of the shooting that had taken place in another building at the base, said the gunman told him his weapon was a paintball gun and that it was for a training exercise. The photographer said was skeptical and began following and taking photographs of the man, whom he identified in court Tuesday as Hasan. Prosecutors entered several of those photos into evidence that show the shooter walking as other people ran from the scene. Those photos have not yet been released to the public. Bennett's photos also captured an image of the wounded suspect on the ground after a shootout with police. Separately Tuesday, a sworn statement from Fort Hood police Sgt. Mark Todd, who is credited with taking down the shooter and did not appear in court, was read in the trial. Additionally, an Army doctor testified that Hasan told her a month before the shooting that "they will pay" if he was deployed to Afghanistan. After the prosecution rested, the judge, Col. Tara Osborn, dismissed the jury and said "We'll resume tomorrow with the defense's case, if any." Hasan has kept mostly silent during the first two weeks of the trial and it's not clear whether he'll take the stand in his own defense. Court is scheduled to resume at 9 a.m. Wednesday.